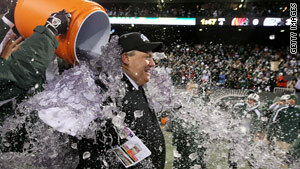 New York Jets players dump Gatorade on coach Rex Ryan to celebrate beating Cincinnati Bengals last week. (Mental Floss) -- Snow and ice may be dominating the weather report, but January is also a great time for another very specific type of precipitation: the Gatorade shower. With the college bowl season winding down and the NFL playoffs heating up this weekend, get ready to see some coaches covered in sports drink. Here are the answers to some burning questions about this fairly new tradition. Although the exact origins of the tradition are hotly debated, former New York Giants defensive tackle Jim Burt often gets the credit for the first bath. According to Darren Rovell's interesting book "First in Thirst: How Gatorade Turned the Science of Sweat into a Cultural Phenomenon," Burt had the idea for the prank while the Giants were struggling during the 1985 season. Head coach Bill Parcells had been riding Burt pretty hard before a midseason game against the Washington Redskins, and after the Giants emerged from that game with a 17-3 win, Burt playfully dumped a cooler full of Gatorade on the Big Tuna. Linebacker Harry Carson, a favorite of Parcells, took the baths to the next level. While Burt eventually decided the dousing had lost its originality, Carson kept it up, showering Parcells with Gatorade after each of the Giants' wins en route to their Super Bowl championship during the 1986 season. However, while Burt and Carson popularized the Gatorade shower, they didn't pull off the first dunking. That honor goes to former Chicago Bears lineman Dan Hampton, who collaborated with teammates Steve McMichael and Mike Singletary to get coach Mike Ditka wet after a regular-season win over the Vikings in 1984.
Who was Carson's most famous victim? When the Giants made their trip to the White House in early 1987 to celebrate their Super Bowl victory, Carson brought the tradition with him. His target: none other than Ronald Reagan. Of course, it would have been a crime to mar Reagan's fastidiously styled hair with sports drink, so Carson showered the president with a Gatorade cooler full of popcorn. Carson later wrote on his Web site, "How many people can say they did that to the President with Secret Service agents standing near with guns under their jackets?" What did Gatorade think of the whole idea? How could any company be irked by such great free advertising? When Gatorade's head of sports marketing, Bill Schmidt, heard John Madden describing the Gatorade shower to millions of viewers during a Giants-49ers playoff game, he said, "I think I've died and gone to heaven." Did Parcells and Carson get anything for their trouble? After the G-Men won the Super Bowl, though, a more formal endorsement seemed like a good idea. Parcells got a $120,000 deal for a three-year deal, and Carson picked up $20,000 of his own. Did any coaches truly loathe the Gatorade bath? Of course. Legendary Miami Dolphins head coach Don Shula wanted no part of a Gatorade shower and ordered his players not to douse him. Has a victory bath ever turned deadly? Possibly. In November 1990, 72-year-old former Redskins and Rams coach George Allen led Long Beach State to a season-ending victory over UNLV, and his players rewarded him with a dunk from the cooler. Dousing a septuagenarian with cold liquid is a questionable move even in a temperate climate, and the drenching did quite a number on Allen's body. He died of ventricular fibrillation on December 31, 1990; just one week earlier, he had commented in an interview that his health had never really returned following the bath. Don't blame Allen's death on Gatorade, though. According to Allen, the team "couldn't afford Gatorade," so the possibly deadly liquid barrage was regular old ice water. What other Gatorade baths have gone wrong? It wasn't deadly, but the Gatorade shower Kentucky coach Guy Morriss received in the waning moments of the Wildcats' 2002 game against LSU was pretty embarrassing. With just seconds left to play in the game, Kentucky looked like a lock to pull off a major upset over the Tigers, so Morriss' players doused the coach with Gatorade. Unfortunately for Morriss and Big Blue Nation, there's a difference between looking like a lock to win and actually winning. LSU wideout Devery Henderson quickly scored a miracle touchdown on a tipped Hail Mary play, and Morriss was left standing on the sidelines, drenched and disappointed. Mental Floss: What's a Crimson Tide, anyway? Has the Gatorade bath made the leap to other sports? Sure it has. When the Boston Celtics captured the 2008 NBA title to end a 22-year drought, Finals MVP Paul Pierce doused coach Doc Rivers with a cooler full of red Gatorade. Reporters speculated that this might have been the first time the Gatorade shower had crossed over to the NBA.